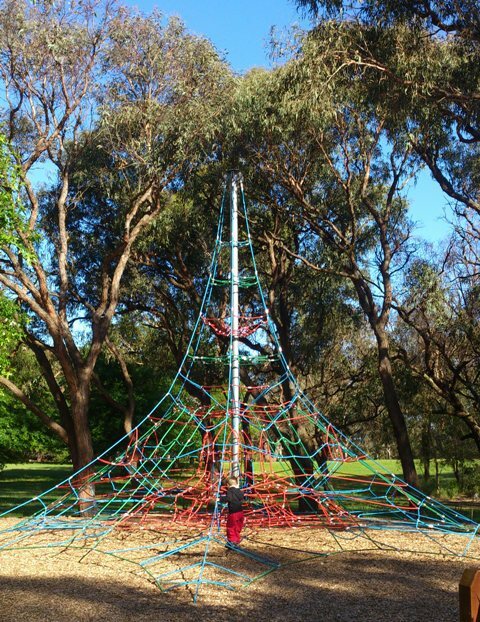 Finding a playground which is safe for your toddler but still exciting for your older children can be difficult. 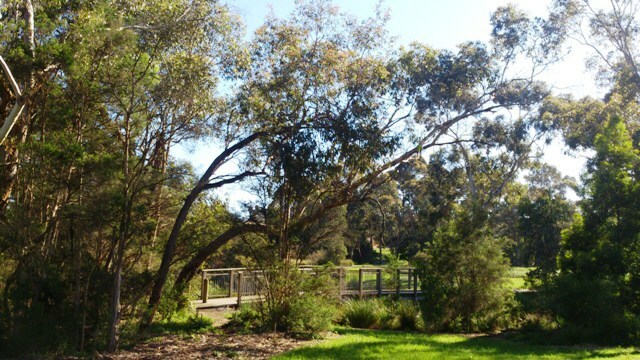 The Elizabeth Bridge Reserve, located on Durham Road, Kilsyth, will get the whole family outdoors and enjoying the fresh air. Great on summer mornings: the trees provided dappled shade over most of the playground. 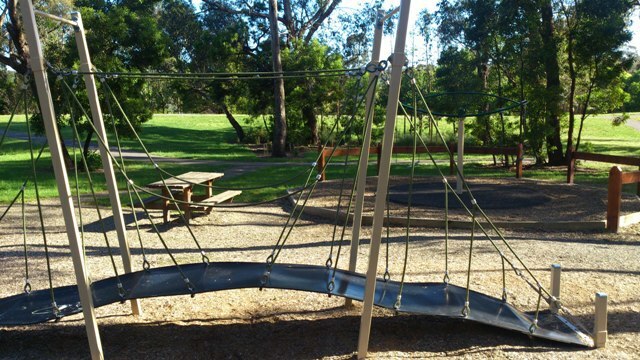 Upgraded in 2012, the playground is extensive, featuring sections with balance beams and tunnels for the littlies just learning to walk, plus a wobbly bridge, two slides, monkey bars, ladders, regular swings and merry-go-round swings for the older kids who have found their feet and learned that it's not ok to just step off the edge of the play equipment! Budding Spidermen will be thrilled. Your kids will think they're Spider-man with the enormous 7-metre high rope dome, and they'll need superhero strength to make it to the top of the double sided rock climbing wall. Bring the bikes, kites, balls and toy airplanes, there are plenty of sealed walking tracks here for kids to ride around on safely and open spaces for kick-to-kick or simply to explore. 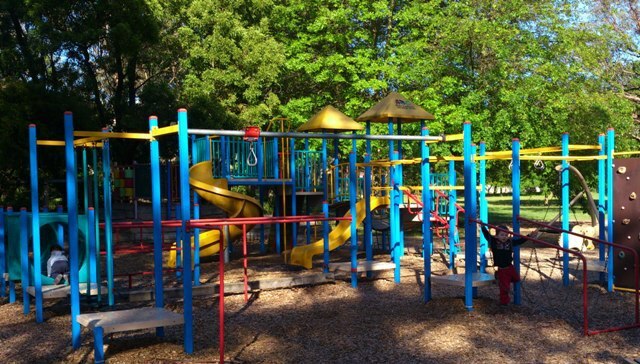 The playground is set back around 50 metres from the carpark and 100 metres from the road. 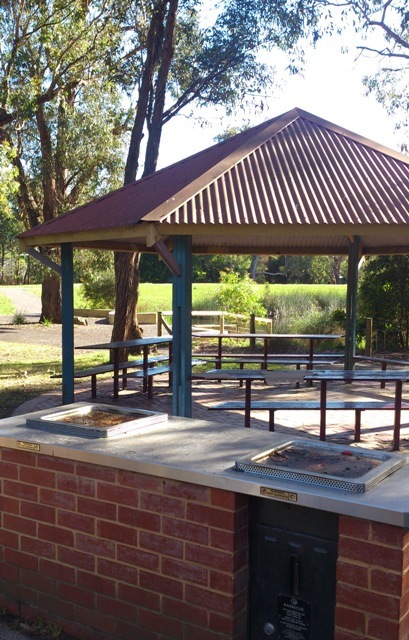 Barbecue facilities are available and there are plenty of picnic benches as well as a covered rotunda to sit and enjoy your picnic or sausages. Make sure you save some bread to feed to the ducks splashing around the lake and gliding under the bridge which gives the Reserve its name. 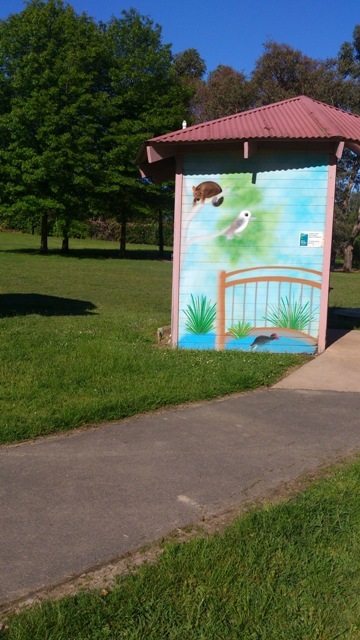 Local artists have decorated the two public toilets which are conveniently located between the playground and the carpark. Take a moment to admire their handiwork before going about your business. Looks like a handy hangout for parents with different aged children. The only problem with playgrounds that have things for all ages is that you have to keep an eye out that the little kids stay off the big kid equipment. We took 50 senior school children from St Richard's Primary School, Kilsyth to this excellent facility. There are so many different features in this reserve that every student was engaged and entertained. From watching the ducks to playing footy under the trees to playing on the great equipment; everyone enjoyed themselves. And thank goodness for the rotunda during the rain showers!